Consumers today are savvy, fickle, and demanding. How do consumer packaged goods companies grow profitably in these challenging times? By aligning every aspect of their operations to the end customer. By knowing what consumers are thinking? By understanding the trends and making dynamics. By being ahead of the curve to help meet evolving consumer and customer demand. Sustainable product innovation: Increase process transparency, encourage continuous innovation, and accelerate time to market. Procurement: Streamline sourcing operations, improve supplier collaboration, and help ensure traceability and compliance. Agile manufacturing: Optimize manufacturing capacity and utilization to quickly translate demand signals to production. Real-time supply chain: Improve forecast accuracy to enable fast, profitable response to dynamic consumer demand. Sales and marketing: Reach, engage, and serve consumers with timely, relevant, and personalized information and offers. Sustainable Product Innovation – Increase the transparency of the innovation process while encouraging continuous innovation. Procurement – Streamline sourcing operations fostering collaboration with suppliers and enforcing compliance. Agile manufacturing – Optimize manufacturing capacity by rapidly translating demand signals into shop-floor orders. 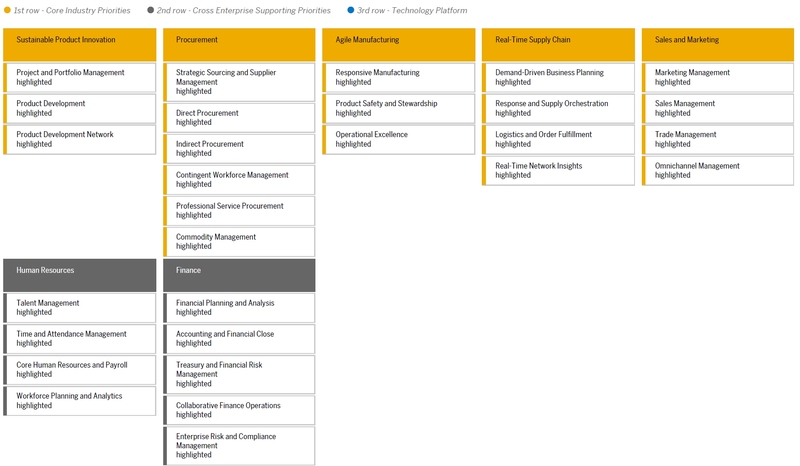 Real Time Supply Chain – Increase visibility into demand to synchronize and collaborate across a global supply network. Sales & Marketing – Engage consumers with valuable information and offers tailored to increasingly refined segments. Platform & Technology – Enable a flexible, scalable, and cost-effective enterprise platform to be consumer driven. Respond to market dynamics – faster – from idea to launch. Be first to market, maximize ROI, and deliver stellar customer service.